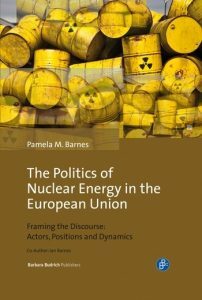 In her new book, based on long-standing research on the politics of nuclear energy in the European Union, Pam Barnes, associate researcher at the EU-Asia Institute (ESSCA School of Management) retraces how public perceptions and political discourses on nuclear power have evolved since the signing of the EURATOM treaty in 1957. Researching developments in EU environmental and energy policies from the early 2000s I became increasingly aware that the EU’s evolving energy and climate strategy included the use of nuclear energy. But I was confronted by a riddle. How could something that seemed to have so much early promise have created so many controversies? Indeed the use of nuclear fission technology to generate electricity in the European Union is arguably the most controversial of all the available electricity generating technologies: nuclear energy deeply divides public opinion both within and between the EU’s member states. In the early 2000s civil use of nuclear as an energy resource had been portrayed by the European Commission as ‘a less than perfect energy option…’ linked as it was to military use of the technology. At that time, levels of support for the sector still suffered from the widespread devastation caused by the accident at the Chernobyl nuclear power plant in 1986. As the 2000s advanced, however, a number of factors combined to lend a new credibility to nuclear energy. I began to question why this change had taken place and what the implications of the change might mean for the future of the nuclear energy sector in the European Union. Today, the peak periods of reactor development in the EU European states have clearly ended but this does not mean the demise of nuclear energy in the EU. As a consequence, the structures that have been developed within the EU for safety and research cooperation and collaboration, supported by the often over-looked 1957 European Atomic Energy Community Treaty [Euratom], continue to have value and must be maintained. The economic, political and social environments for the nuclear sector in the EU are very different in the twenty-first century from those of the mid twentieth century when European governments began to support the use of the technology to generate electricity. There has been no significant large-scale reactor building programme since the 1990s in the EU, with many currently operating reactors being at risk of closure before the end of their operating licenses. At the end of 2017 only 4 reactors were under construction in EU countries with major controversies surrounding a small number of planned developments. Some EU states evidence a long standing and deeply held opposition to the use of the technology [Austria, Denmark]. Germany’s energy transition programme the ‘Energiewende’ is based on twin objectives – to move from fossil fuels to a largely carbon free sector and at the same time to phase out nuclear generation of electricity by 2022. Even in France, second only to the US as a producer and user of nuclear energy globally, a decision was taken in 2015 to cut back on the use of the technology from 75% of electricity generated to 50% by 2025, although more recent debates in the French government suggest the target year will rather be 2035. This does not however signal the end of use of nuclear technology to generate electricity in the EU. The process of enlargement from 2004 to 2013 increased the number of EU member states where nuclear energy was generated and used. Enlargement of the EU also increased the challenges of EU energy dependency and the search for indigenous energy resources. Nuclear energy relies on small amounts of imported uranium and with the potential for re-processing nuclear energy could arguably be included as an indigenous resource. As such, nuclear energy has a role to play in providing energy security at a time of high import dependency. But the most important factor gathering support for continued use of the technology has been the questionable identification of nuclear energy as a sustainable, low carbon, and thus desirable, energy resource in the transition to a low carbon economy in Europe. Despite spectacular growth in the use of renewable technologies, green technologies are portrayed as incapable of reducing fossil fuel consumption in European countries in the short to medium term. Indeed in most policy scenarios the search for an environmentally and economically sustainable energy resource to replace fossil fuels includes consideration of nuclear generation of electricity. The longer-term future for nuclear energy in the EU appears to be as a resource in an increasingly diversified energy mix as more use of renewable technologies is made. The outcome may bring a new dimension to the European nuclear sector with a focus on more limited electricity generation but with increased levels of employment in a range of varied technology developments associated with small modular reactors, fusion technology and the growth of de-commissioning and waste management programmes and facilities. In any event using nuclear technology will be reliant on a combination of consensus in the political discourse and acceptance in the public discourse. It depends on the credibility of emerging storylines in the narrative that portray nuclear energy as capable of making a significant contribution to curbing greenhouse gas emissions and providing energy security, both of which are contested arguments. Public attitudes to the use of nuclear technology remain divided but re-framing the discourse in terms of the threat from climate change has brought with it an element of acceptance and some of those previously vehemently opposed to nuclear energy are ‘thinking again’. The discourse presents a ‘win-win’ situation from using nuclear electricity as it is depicted as a significant provider of volume base-load energy that limits greenhouse gas emissions and enables access to electricity at a stable price. But this political discourse would appear to have been captured by a narrative that represents ‘cynical idealism’ [global warming and environmental protection need the use of nuclear technology, irrespective of economic costs and public concerns] and pragmatic acceptance [energy demands may only be met by the use of nuclear technology], rather than unconditional and enthusiastic public support. Italy before the elections: sliding slowly, eyes wide open, into durable decline? Published on 1 March 2018 by Antonella Forganni | Comments Off on Italy before the elections: sliding slowly, eyes wide open, into durable decline? Following the German trend? Austria votes on Sunday. Published on 13 October 2017 by Heidi Maurer | Comments Off on Following the German trend? Austria votes on Sunday. The Czechs are going to vote. And strengthen the populists further. Published on 9 October 2017 by Petr Kaniok | Comments Off on The Czechs are going to vote. And strengthen the populists further. Catalonia: Headlong into the unknown. Change of mood on the Euro. Even at EUSA 2017! Published on 11 June 2017 by Miguel Otero Iglesias | Comments Off on Change of mood on the Euro. Even at EUSA 2017! Alliance Europa is the European Studies consortium of the Pays-de-la-Loire region in Western France. Based in Nantes, Alliance Europa is an interdisciplinary university hub for research and education, but also includes an laboratory for innovative projects with civil society named "The factory of European ideas". Alliance Europa runs its own multiblog in French, a selection of which is published in English on Ideas on Europe.